I haven't been able to do makeup looks much lately, simply because I haven't had the time! I've done some face painting on children, my normal nutrition sessions and quite a few dinners (mainly birthday ones). I did however manage to take a couple pictures of a leaving dinner I went to where I wore a lovely velvet wine coloured red dress. Although the occasion wasn't actually romantic, I decided to use it as a possible Valentine's look seeing as it had red in it and the dress is pretty romantic! I pretty much used the same format as my Christmassy look (here), but instead of green I used black eyeshadow for the outer corner and more yellow-gold. Hope you like the look, I'll try doing more Valentine's looks where poss, but these looks I've done are pretty and suitable for Valentine's too: Simple Touch of Magic, gold eyes & red lips, neutral/brown look, or a pink-purple look. Also, if anyone's going to the London IMATS this weekend, let me know! I'll be going this Sunday.. I'm super excited! Oh my GOSH it's a Pixi haul! Hello my lovelies, sorry I've been a bit quiet this week, been busy of late and next week doesn't look that less busier! I had "training" yesterday (Thursday) on a couple bath & body products (part of my job), including brands such as XEN tan, L'occitane, Bliss & Natio. We got lovely little freebies, it was a lovely fun day! At first the texture seems gloopy/lumpy and doesn't feel like it will give full coverage, but after the second coat it looks somewhat normal and by the third, flawless. I have to say it dries exceptionally fast and after I'd tested it out on my nails I couldn't stop staring at how amazing they were, how they shined when my hands moved! The other thing I picked up was a Bourjois metallic eyeliner in "bleu clinquant" (no. 54), as the colour is lovely and I wanted to try it in comparison to the UD ones I use. It glides on lovely and smooth just like the UD 24/7 eyeliners and lasted on my hand even after some hand (soap) washes! I hope to do a makeup look with this soon! Both brushes are double ended and very handy! The eye define & smudge consists of a mini eyeshadow brush which would be great for applying eyeshadow to corners and blending, and the "define" end is a great liner. The brow fill and brush looks good for the brows, one end a slanted liner brush and the other a mascara/brow brush. I also got a lot of the Pixi "lip blush" colours, four in fact! Love (a coral-red), Youth (a light pink), Beauty (a neon pink) and Desire (purple). Admittedly, they do look like highlighters, but I'm a sucker for lip tints/stains, so I had to buy them all when I saw how discounted they were! Last but not least, I bought the "eye zone brightener" and "undercover" concealer..
My hand colour does vary to my face colour so the concealer looks a tad better on my face, and I do love the fact it isn't a shiny formula, yet moisturising enough in a liquid format. I do hope this post helps with those of you who aren't familiar with these brands/have wanted to try them but haven't! As promised, here's the makeup looks I did last week whilst I had my inlaws around. I'm going to use the same names that I used from my last post of sleepover makeup (here); Exhibit 1 (cousin J) wanted natural/neutrals, exhibit 2 (cousin Z) wanted a smokey look with brown, and exhibit 3 (sister in law Y), wanted to try pink/purple. I used the Manly 120 palette for all three looks, if you would like to know which exact colours I used I'll try my best to remember! Which is your favourite? Also, with smokey eyes, what do you think is a good lip colour and cheek colour? It was lovely making them and even yummier eating them! I've been wanting to do a 60s look for a while now and was inspired by a friend on a makeup counter who regularly does a 60s style, but with different coloured glitter. I decided to make use of my MUA glitter eyeliner, after Pixiwoo's recommendation here. To start, I lined the bottom waterline with Barry M white eyeliner, followed by UD El Dorado on top of the white. For the top eyelid I used UD Ink for Eyes for a thick top liner, then also drew a line in the crease with the same liner, but not joining the top liner to it, so that it's a single line in the crease only. 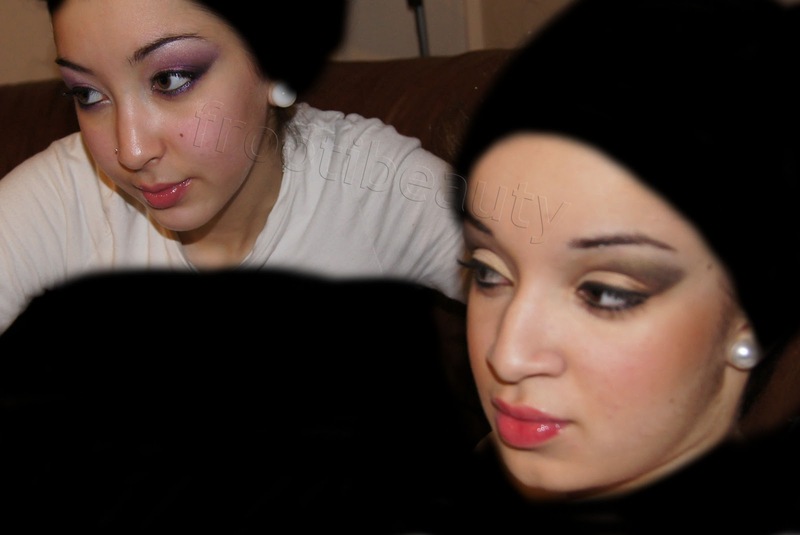 The crease line can be as thick as you like, but I decided to make it fairly thick for a full on dramatic look. I used the Ink for Eyes very lightly under the white/El Dorado line on the bottom lash line also. I then added the MUA glitter eyeliner in between the top liner and crease line, filling in the full space from inner corner to outer corner of the eyelid. For the lashes I used Dior Iconic for the bottom lashes as its not as big in brush size as the others; for the top lashes I used the Girls Aloud Kimberley lashes.